Published: Sept. 30, 2010 at 07:29 p.m. 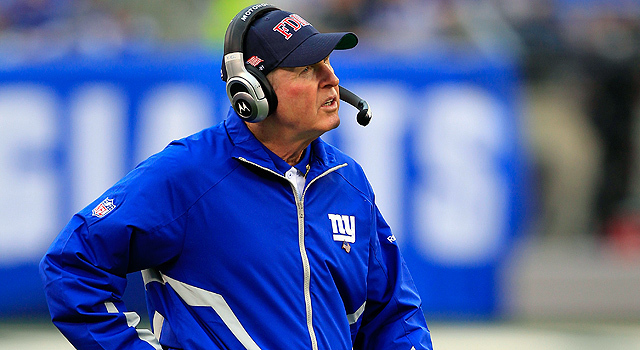 Though his hard-nosed mentality has worked before, Tom Coughlin might be losing his team with it this season. It has been often stated that a team takes on the personality of its coach. But after watching recent tapes of the New York Giants, it's apparent that isn't the case with this team. Tom Coughlin is in his 13th season as an NFL head coach, and his teams have been known for their discipline, toughness and tenacity. He stresses accountability and attention to detail from each of his players. Though he has been taken to task for his strict rules, he is a proven winner -- and a Super Bowl champion -- with a track record of getting the most out of his players. When I played for the Jacksonville Jaguars in 1996, I witnessed his first-hand how Coughlin sets the standard for performance through his detailed approach. From arriving to meetings five minutes prior to the scheduled time to crossing the "Concentration Line" heading to the practice field, the emphasis on taking care of the little things is constantly stressed in everything that is done. Although we griped vigorously after jumping out to a 3-7 start, we finished the '96 season with eight straight wins and landed in the AFC Championship Game after we adopted Coughlin's mentality. The Giants rolled to Super Bowl XLII in the same manner after finally relenting to Coughlin's hard-nosed methodology, but it appears that the team isn't buying into his tactics this year. The Giants aren't playing with the trademark toughness and discipline that embodies Coughlin's squads, and their lack of focus has cost them in recent weeks. An assortment (large number) of mistakes cost the Giants last week against the Titans. New York missed two field goals, had two turnovers inside the Titans' 6-yard line, surrendered a safety on an illegal chop block in the end zone, and committed five personal fouls. Given that litany of errors, it's not surprising that the Giants lost a game where they racked up 461 yards of total offense, while Tennessee only gained 271 and had four drives reach goal-to-go territory. The Giants are doing a great job of defeating themselves with self-inflicted wounds. The team has lost 10 of their last 14 games dating back to last season, and their issues with turnovers and penalties have been the primary cause. What makes those problems so mind-boggling is the fact that Coughlin and his coaches spend an inordinate amount of time emphasizing those points. The virtues of ball security and self-control are constantly stressed, but players have to take that coaching to the field. In the heat of battle, they must rely on the techniques that have been sharpened through countless repetitions in practices, rather than falling prey to the sloppiness that sometimes occurs when fatigue sets in during the late stages of a game. There needs to be an element of self-accountability for taking care of the details on the field, and it needs to come from the team's leaders. Eli Manning, Justin Tuck and Shaun O'Hara have to demand better play from their teammates, and the role players must be willing to meet the challenge. Michael Strahan and Antonio Pierce provided that kind of prickling during their Super Bowl year when the season appeared to hang in the balance. Someone must emerge as that vocal leader again. The Giants still harbor championship aspirations despite their slow start, but it will take the emergence of a strong leadership core willing to adopt and incorporate the fundamental edicts of their coach to make it happen. With a challenging Sunday night contest against the Bears on tap, we will soon see if the Giants' locker room has the leadership to prompt the team to fall in line behind their shrewd coach. The loss of Kevin Faulk led to many questions regarding how the Patriots would make up for the clutch production of the 12-year veteran. After watching tape of their win against the Bills, it appears that New England will rely on a collection of young talent to compensate for his void on offense. Faulk, who suffered a season-ending knee injury in the team's Week 2 loss to the Jets, often served as Tom Brady's favorite target in clutch situations. As a talented multi-purpose weapon with outstanding skills, Faulk provided the Patriots' offense with a unique playmaker capable of creating mismatches in space. Faulk's ability to serve in a variety of roles has prompted the Patriots to split his responsibilities among a host of young players. In analyzing the tape of the Patriots' win over the Bills, New England placed some of Faulk's responsibilities on the shoulders of Danny Woodhead and Justin Edelman. The Patriots often operated out of one-back sets with Faulk on the field, and the team continued to do so with his replacements in the lineup. Woodhead, who rushed for 42 yards on three carries, was the designated ball carrier on the team's draw plays and provided one of the game's biggest plays on his 22-yard touchdown run. Edelman, the team's third-receiver, also lined up in the backfield as a quasi-running back and had some production as a runner/receiver. Though he only totaled nine yards in the game, his ability to eventually fill-in as a part of the Patriots' backfield allows the team to continue to use their spread formations to create favorable matchups in space. While Edelman and Woodhead handle all of the backfield duties, the clutch playmaking is falling to the Patriots' athletic tight end tandem. Aaron Hernandez and Rob Gronkowski have emerged as key components of the team's aerial attack, and the rookie duo has seen more balls fly in their direction with Faulk sidelined. Hernandez, the Patriots' second-leading receiver with 13 receptions for 211 yards, has quickly emerged as one of the team's top playmakers. He has been deployed in a variety of spots to take advantage of favorable matchups against linebackers and undersized defensive backs. While few expected Hernandez to emerge as a difference maker in his first season, he has already recorded five receptions of at least 20 yards, including a pair of 40-plus yard receptions that showcased his outstanding running skills. Hernandez does most of his damage between the 20s, and Gronkowski is a key red zone weapon. The 6-foot-6, 264-pounder towers over defenders, and Brady takes advantage of his superior size by throwing the ball high to Gronkowski in the corner of the end zone. With defenses tilting their coverage in the direction of Wes Welker and Randy Moss, Gronkowski's ability to win against one-on-one coverage will continue to be a major factor in the team's red-zone success. Faulk's absence had the potential to cripple some of New England's offensive plans, but the emergence of a host of young playmakers continues to make the unit one of the league's most difficult offenses to defend. It seems like only yesterday when Carson Palmer was thrust into the conversation as one of the league's top quarterbacks. The eighth-year pro had entered rarified air after tallying two 4,000-yard seasons within a three-year span (2005-2007) while also earning Pro Bowl berths in two of those seasons. He impressed scouts and coaches with his outstanding arm strength and accuracy. Palmer frequently showed that he was capable of making every throw, from anywhere on the field, with excellent velocity and touch. His ability to throw the deep ball made the Bengals' offense difficult to defend, and their aerial attack finished within the top 10 in each of those three seasons as a result. Palmer hasn't looked that stellar in recent years, though. He has only topped the 300-yard mark twice in his last 23 starts, and his current passer rating (71.3) is his second-worst mark of his career. His accuracy has declined significantly, as he is only connecting on 56.6 percent of his throws. Those numbers are even more startling when factoring in the significant reduction of deep throws incorporated into the game plan. In Palmer's outstanding three-year run, he averaged 7.2 yards per pass attempt and connected on 32 passes over 40 yards. With the deep ball heavy in play, the Bengals kept pressure on the defense and often dictated the tempo of the game. Since suffering a season-ending elbow injury during the 2008 season, Palmer has seemingly lost his luster. He has shown a reluctance to push the ball down field, and the vertical throws that he occasionally makes have routinely been off target. Last year, Palmer's dramatic reduction in deep balls was attributed to the Bengals' underachieving cast of receivers, but he has continued to play small ball despite having an upgraded receiving corps this year. Terrell Owens, Jermaine Gresham and Jordan Shipley joined Chad Ochocinco during the offseason to provide Palmer with a plethora of weapons. Gresham and Shipley were expected to act as middle-of-field threats, while Owens was counted on to provide big plays on the outside. Although each has added a dimension to the Bengals' passing game, the offense has not lit up scoreboards as expected. Palmer's accuracy woes have led to the team's struggles inside the 20. As the offense nears the goal line, the windows in coverage shrink dramatically, so it is imperative that the ball is thrown on point. Palmer has been unable to connect with his receivers on those throws, and the Bengals have been forced to settle for field goals instead of touchdowns in the red zone. Many expect Palmer to get back on track against the Cleveland Browns this Sunday, but it's not a given that he will find his rhythm against a defense that ranks 12th against the pass. The Browns are only surrendering 199 yards per game, and they have done an excellent job of keeping the ball in front of their coverage (Browns have not allowed a pass play over 40 yards this season). Given the fact that Palmer has failed to pass for more than 200 yards in nine of the Bengals' last 20 games, it is unlikely to happen against the Browns. And the questions regarding Palmer regaining his status among the ranks of the elite will continue for another week.